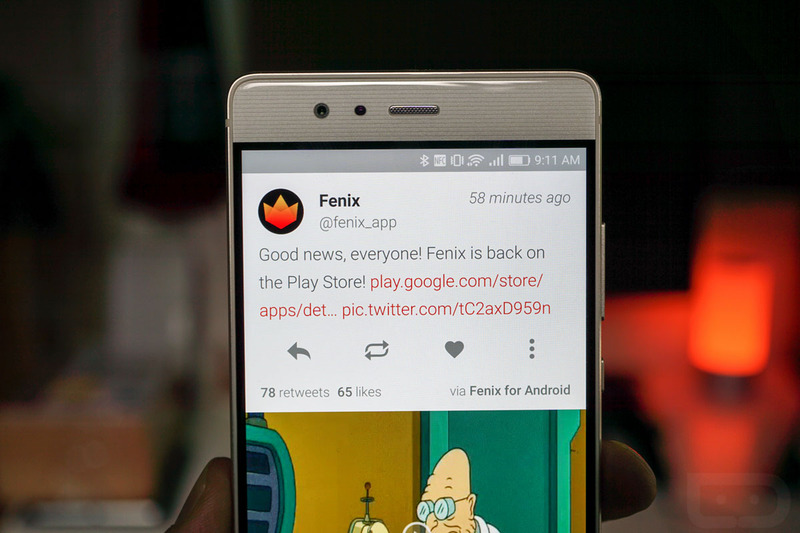 This morning, Fenix, the popular Twitter app on Android that hit Twitter’s ridiculous token/user limit, returned to Google Play. That seemed odd to us since the removal was likely a part of a realization that the developer shouldn’t be selling an app to users who weren’t ever going to be able to login. So we reached out to the developer and he responded with a somewhat cryptic Tweet that is certainly interesting, especially to other 3rd party developers worried about Twitter’s limit. In response to us asking if the return was due to the fact that Twitter gave him more tokens or “just because,” Matteo Villa said that he had “been in contact with the Twitter team and they’ve helped to fix the issue.” When probed further, Villa said that he was not able to provide any additional details. Of course, our brains are now zooming. Does that mean that Twitter did indeed lift the token limit on Fenix? Did it give Fenix an additional 100K? Are they about to do something similar for all 3rd party developers? Does this mean Falcon Pro and others who reached the limit years ago can rise from the ashes? We’ll see what we can find out. We’ve reached out to Twitter. UPDATE: What we know now is that this may be one of the first examples of Twitter being more developer friendly again. When Jack Dorsey returned as CEO last year, he made it clear that developers were going to be a big focus. While Twitter still has their policies in place about 3rd party apps not mimicking the “mainstream Twitter consumer client experience,” they also left some room in their API limits for giving some apps a pass or the opportunity to work with Twitter to gain “permission” for things like, additional tokens above the 100K limit. In this instance, we have confirmed that Fenix has what it needs in order to continue on as one of the better 3rd party Twitter apps into the foreseeable future. So if you were hesitant to buy into Fenix, you should no longer be worried.